Olivia Cleans Green: Are You Really Living MLK's Dream? Yesterday, I was thinking about Martin Luther King's "I Have a Dream" speech, specifically this sentence: "I have a dream that my four little children will one day live in a nation where they will not be judged by the color of their skin but by the content of their character." I couldn't resist wondering if I'm living MLK's dream. Do I judge others based on their character- on who they really are- instead of how they appear on the outside? Think so. Do I judge myself on my character instead of my appearance? It's been a journey. I used to judge myself harshly on how I looked. A a child, I had "ugly" teeth. As a pre-teen, I was "flat" and I had "bad" skin. By 16, I was suddenly curvy and not thin enough, even when I got down from 135 to 101 pounds. There were many times I used the way I looked as a reason to not spend time with friends, to not eat nourishing foods, to not pursue interests. In short, I used my appearance as a reason to not fully love myself. And by "reason," I mean, reason. It felt totally sane and logical to tell myself something was "wrong" with me and therefor I didn't deserve to live life with the same freedom and happiness that a more attractive person should have. How crazy is that? I'm happy to say that I don't feel that way anymore. Most days, I know I am beautiful (and talented and able to do or have anything I set my mind to). It didn't happen overnight. I got a lot of support from friends, I worked with a counselor, and I did a lot of work on my own. I think the most important change was I opened myself to possibility that I am a good person who deserves love. Therefor, I started treating myself with love. Are you waiting until you are a certain dress size or have clear skin to love yourself? Are you waiting to have more money, a better job, or a lover to be happy? Please don't wait. Love yourself now because you are a beautiful, perfect person exactly the way you are right now. As an added bonus, treat yourself with fairness and tenderness and you'll attract all the wonderful things you want. I promise. Try it out! And if you need support, I'm here for you. What do you think? 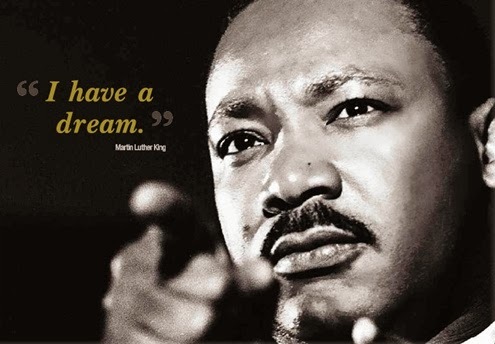 Are you really living MLK's dream?